In the wake of the enormous success of Shane, Alan Ladd formed his own production company, Jaguar Productions, and this was its first film. 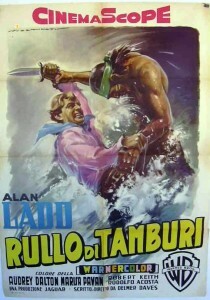 Here Alan Ladd is Johnny McKay, former Indian fighter and now peace commissioner to the Modocs by appointment from Pres. Ulysses Grant. He has two romantic interests going on in the film: Toby (Marisa Pavan), daughter of the peaceful former Modoc chief, and Nancy Meek, niece of a local rancher and family friend of the Grants. Charles Bronson in an early role (his first under that name rather than as Charles Buchinsky, his real name) is a muscular Captain Jack, leader of the warlike portion of the Modoc tribe. 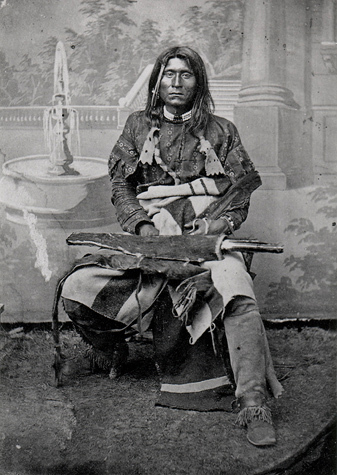 The story bears only a passing resemblance to the actual course of the Modoc War of 1872-1873 in northern California and southern Oregon, and these Modocs mostly look more like a cross between Apaches (colorful cloth headbands) and plains tribes (leather shirts, etc.). The warlike Captain Jack kills most of the peace commissioners, including General Canby (Warner Anderson), and leaves McKay for dead. The rest of the war isn’t shown much until McKay captures Jack, and Jack is sentenced to be hung. Toby is killed in the course of all this, so McKay is left with just one romantic interest by the end. Anthony Caruso is Toby’s brother, who also doesn’t trust Captain Jack; Elisha Cook, Jr., is Crackel, trading arms and information to the Modocs. So it appears that both sides have two factions. 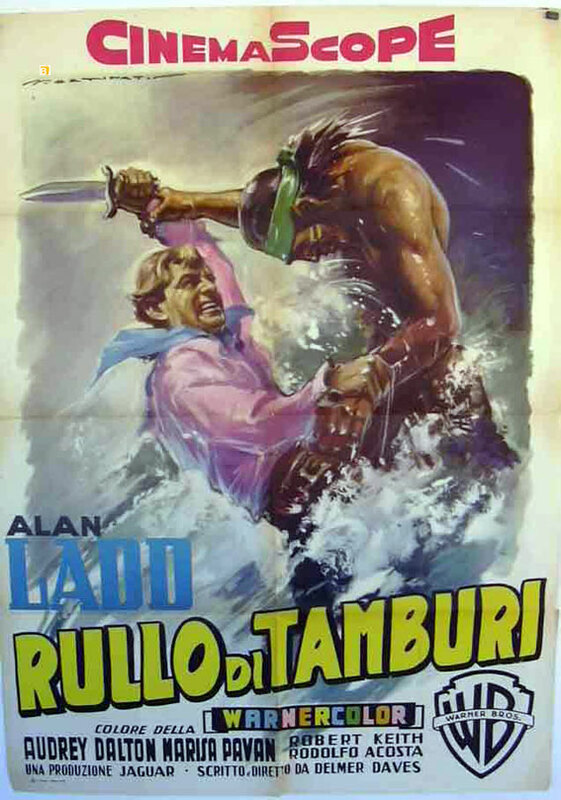 McKay (Alan Ladd) and Captain Jack (Charles Bronson) fight it out in a river. The New York Times noted “Charles Bronson is probably the most muscular Indian ever to have brandished a rifle before a camera,” and Peter Baker wrote in Films and Filming: “[Alan Ladd’s] performance is dwarfed by that of Charles Bronson as Captain Jack.” It wasn’t hard to dwarf Alan Ladd under most circumstances. The relatively short Ladd (at 5 feet 4 inches) is carefully filmed here, but shouldn’t have had much of a chance against any decent fighter the size of Bronson (only 5 feet 8 inches himself, but quite muscular). When Bronson worked as Charles Buchinsky, his agent worried that name would stunt his career during the blacklist era. Legend has it they were discussing possible new names while driving on Bronson Avenue in Los Angeles, looked up at the “Bronson Gate” sign at Paramount Studios, and a future star was rechristened. In the 1970’s, after Bronson had become a global superstar, Drum Beat was reissued in some countries under the title Captain Jack with Bronson’s name on top. This was one in a series of fairly good westerns Ladd made in the 1950s after Shane: Drum Beat, Saskatchewan, The Badlanders. And another in a series of decent westerns made by Delmer Daves during the late 1940s and the 1950s (3:10 to Yuma, The Last Wagon, Cowboy, Jubal, The Hanging Tree). 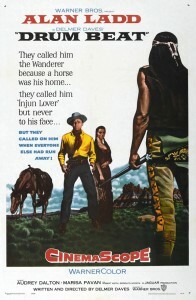 Writer and director Daves had spent much of his youth living on reservations with Hopi and Navajo Indians, and his westerns such as Broken Arrow (1950, directed by Daves) and White Feather (1955, written but not directed by Daves) were notable for their sympathetic portrayals of Indians. The film was shot in northern Arizona’s Coconino National Forest. In color. This is not currently available on DVD in the United States, so it can be hard to find. 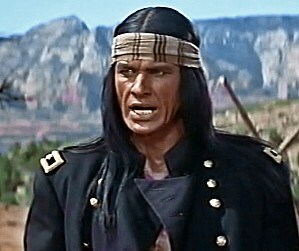 Charles Bronson as Captain Jack; the real Modoc leader Captain Jack (Kintpuash) in 1864. Several books have been written about the Modoc War. Dee Brown had a chapter on Captain Jack and the war in his 1972 best-seller Bury My Heart at Wounded Knee. For a longer account of the war, see Hell With the Fire Out: A History of the Modoc War (1997) by Arthur Quinn. This entry was posted in Westerns Worth Watching and tagged Alann Ladd, Charles Bronson, Delmer Daves, Native Americans (Indians) on July 4, 2014 by Nicholas Chennault.